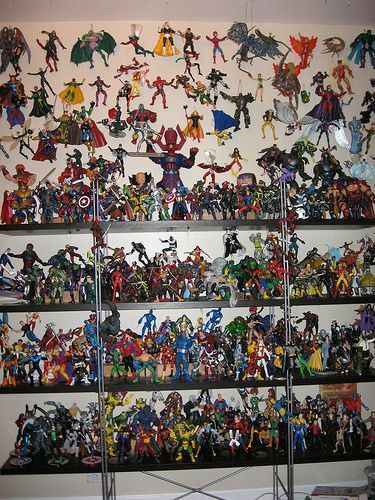 If you collect action figures you know that displaying them can sometimes become a chore. Sometimes they won’t stay exactly where you want them to, or maybe you have so many that the ones in back are hidden from view. Maybe you’re looking for some neat ways to display them. 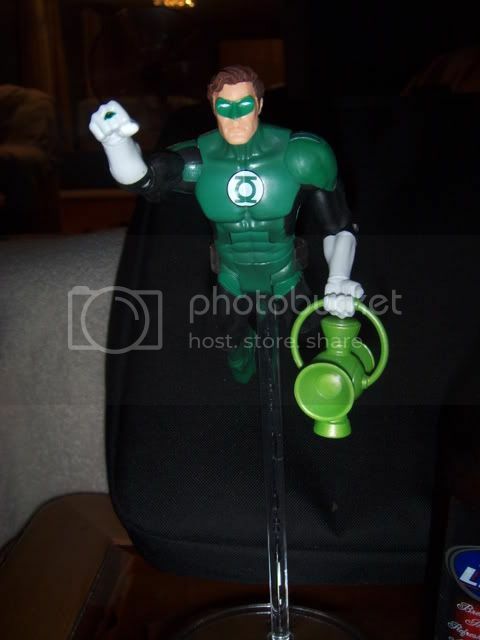 Whatever it is, if you have an action figure collection, take a look. One of the most common issues you will face when trying to display your figures is how to stand them up and keep them there. If a figure is standing without any help, it’s almost a certainty it will fall over at some point. If that happens and it takes down a few of it’s buddies then you have to spend time setting them all back up, so what can you do? First, get some poster tack like this, tear off a little bit, press it onto the feet of the figure, and then press his feet down onto the surface you want him to stand on. Now, I personally have used that tack so I can vouch for it, but you can use other tacks as well. I’ve heard that this tack is also good for mounting your figures. Now let’s say you have a big group of figures you want to display but if you line them up in rows, the figures in back will be hidden. Not if you use this handy shelf, it’s just an expandable shelf for spices but it keeps all of your figures visible in a sleek way. Flight stands are another great way to show off your figures in a neat way. I’ve seen a few neat looking stands before, but this one is a monster. With multiple posable sections and the ability to put several figures on the same stand, those are the bee’s knees of figure bases. But, as with everything different choices are important. One last way to keep you figures visible and give them a flight look is using suction hooks and clear fishing line, or really any kind of see through thread. If the space you are setting your figures up has a relatively low ceiling to it, say shelves or a bookcase, attach a suction hook to the underside of the shelf. Next, run some clear line under the figure’s arms or neck, tie it off, and hang it from the hook. Play around with it until you figure out the right length and look, as you can see, when it’s done well it looks fantastic and really gives your figures the look of flying. The most common place you are going to display your collection is probably a bookcase or shelves, that’s how I have my figures setup. But, after some research(drooling over other folk’s collections) I’ve found something I really like as far as display. Whenever I have the ability to get these I will. The cabinets look absolutely fantastic when filled, being all glass it really makes the whole are look more open and clean. An added benefit to those cabinets is the spice rack I referenced earlier will expand to fit inside. Sometimes you will get figures that come out of the package somewhat damaged. Most times a leg or arm is bent or warped making it difficult for you to display the figure like you want. You can fix this by boiling a pot of water or by microwaving a cup of water until it is sufficiently hot. Dip the affected appendage into the water and let it soak for about 15 seconds. Remove the figure from the water(remember kids, safety first) and bend the arm or leg back into place. Once you have affixed it where you want it, run it under a cold tap or place it in the freezer to cool off. Well there you have it. If you have any other tips or tricks post them in the comments below. If you would like to show off your collection head over to the forums and start a thread, we’d love to take a look.